Posted on February 4, 2019 at 2:08 pm. “ORANGE, Ohio — Ahmed Abouelsoud “hit a Juul” last year when a friend offered it to him. He was hooked from the start. You may not be familiar with the lingo here. “Hitting a Juul” meansinhaling nicotine-laced, flavored vapor from a vaping device made by a company called Juul Labs. The device looks like a computer thumb drive. It’s easy to conceal. And it’s the vaping device of choice for many teens, available at the corner gas station, for sale to 18-year-olds who then sell them to younger friends. “When I actually started being able to breathe in the smoke and get a buzz, I, like, loved it. It was something unlike I’ve ever done before because I’ve never smoked or done anything,” he said. The Orange High School program, called ABC, (For About Change), was the brainchild of Senior Mark Pristash, 18, who was the first to open up to school Ungar-Shafron about his addiction. “After multiple times of trying to quit by myself, I just didn’t know what to do. I didn’t think it was possible. I just thought I was way too addicted,” he said. 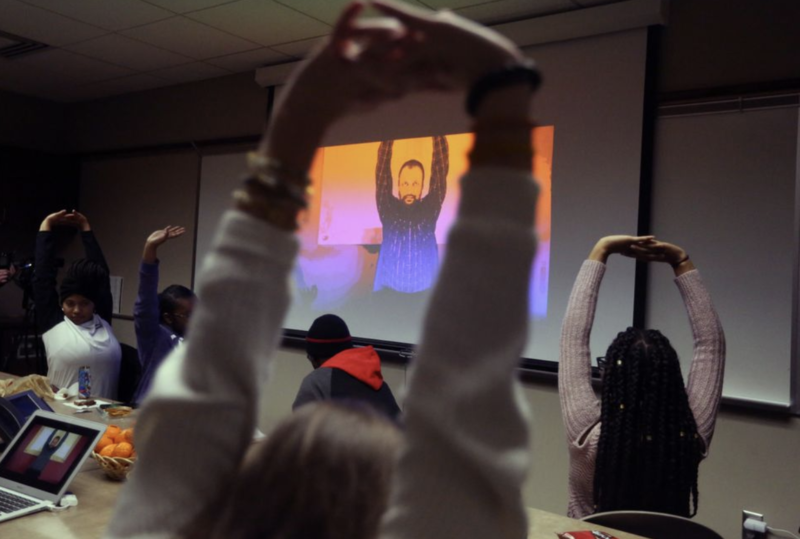 “Once I got through it, I knew it was possible, and I just wanted to give other students the opportunity to learn how to quit something if they’re going through the same thing that I was going through,” he said. So he brought a friend, and then another, and then he and Ungar-Shafron, along with Jessica Venditti, a social worker assigned to the school from the Bellfaire JCB social service agency, created the ABC support group. Students meet on Thursdays — no administration or other teachers allowed. “They’re going to have to commit themselves over and over and over again to their goal, even if they’ve been successful or for a period of time. They’re going to walk into a social setting and be faced with a choice. And so they have to keep working at it,” she said. It’s amazing to see these young people working at it, and daunting when you consider the small size of the group — maybe two dozen kids — relative to the size of the student body, north of 700. Parents, there’s a good chance your child is Juuling, or has close friends — tempting friends — who do. It would be great if every school started a peer-to-peer group like Orange did. But even without it, an honest conversation with your child and some old-fashioned parental snooping is in order. This isn’t about imposing authority, this is about protecting the health of our kids.